World Land Trust (WLT) works with Foundation for the Preservation of Wildlife and Cultural Assets (FPWC) to fund the Caucasus Wildlife Refuge (CWR) in Armenia. Winter time started with extremely low temperatures and heavy snow at Caucasus Wildlife Refuge (CWR), despite Armenian capital Yerevan recording the warmest winter in the history of Armenia, reaching 18 degrees Celsius. Although CWR is located in the Ararat region, which on average has moderate temperatures compared to other regions of Armenia, given its average altitude of 1,800 metres above sea level, it is always prone to heavy snow. Despite this, the weather is never an obstacle for our permanent monitoring of the whole territory on horseback, for camera checks, for wildlife and security observations. FPWC regularly finds evidence of Caucasian Lynx (Lynx lynx dinniki) in the CWR. It seems that there are no less than three individuals walking freely in the territory. Although these larger predators are thriving, there have been no signs of Caucasian Leopard (Panthera pardus saxicolour) within the reserve. Nonetheless, the photos we received from online cameras of the lynx are simply majestic. With so many minks, badgers and hares around, there is obviously enough prey in the CWR. 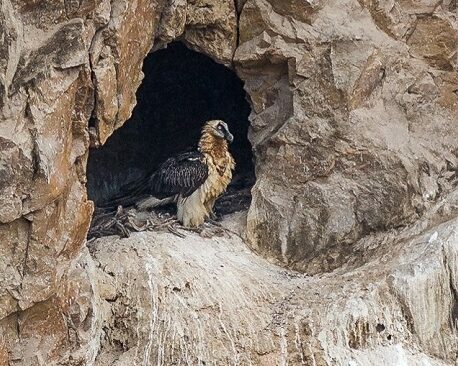 Lammergeier at its nest. © Gareth Goldthorpe. The permanent field monitoring always reveals new species in the area, even for me, a ranger with many years of experience. This time, while guiding Gareth Goldthorpe, the Technical Coordinator for the Caucasus at Fauna & Flora International, he took a photo of a Least Weasel (Mustela nivalis) – amazingly small, yet a cunning and very fierce predator. Given the abundance of prey in CWR area, it is obvious the weasels are thriving. 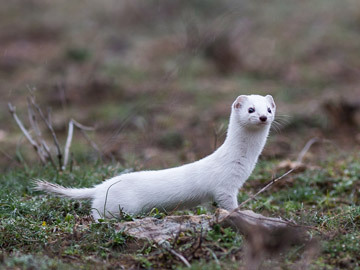 Being able to kill a hare five to ten times bigger than its size, the weasels also change the colour of their fur in winter, with the coat becoming pure white. 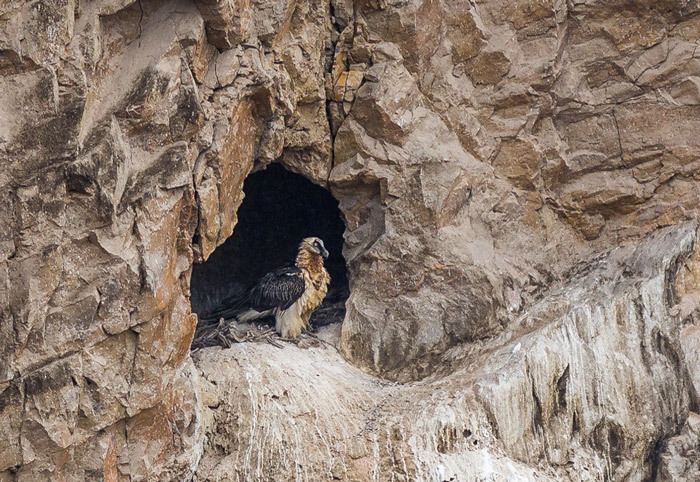 Gareth also managed to take some great photos of the Lammergeier (Gypaetus barbatus) in its nest, this time the pair has made its nest in another part of the same rock, we have previously seen them nesting. In early March, with the snow melting, we have also observed signs of Syrian Brown Bear (Ursus arctos syriacus), waking up from hibernation. The Bezoar Goat (Capra aegagrus aegagrus) is no longer a rare animal in the CWR. With effective conservation work on the ground, these magnificent mammals, the ancestors of domesticated goats, are not afraid of human beings, and tourists visiting CWR often encounter them during their hiking or horse-riding tours. Bezoar Goats are no longer a rare sighting in the reserve. © FPWC. The hunting of Bezoar Goats was widespread 25-35 years ago, and has led to their listing as endangered in Armenia’s Red Book of threatened species. Unfortunately in some areas poaching is still a problem. One of the main reasons that Bezoar Goats were hunted was to obtain a bezoar-a stone like mass found in the stomach of the goats. Bezoars were sought because they were believed to have the power of a universal antidote against any poison and bezoar stones were seen as valuable commodities sometimes with magical healing properties. Luckily hunting for bezoars has decreased significantly, yet still continues for trophies such as their impressive horns. This winter was particularly successful for the old world vultures. FPWC has restarted the vulture’s feedings in the CWR by putting carcasses of dead animals in front of the online cameras. Several Cinereous Vultures (Aegypius monachus), flocks of Griffon Vultures (Gyps fulvus), Lammergeiers and Golden Eagles (Aquila chrysaetos) were having a real feast during winter time. 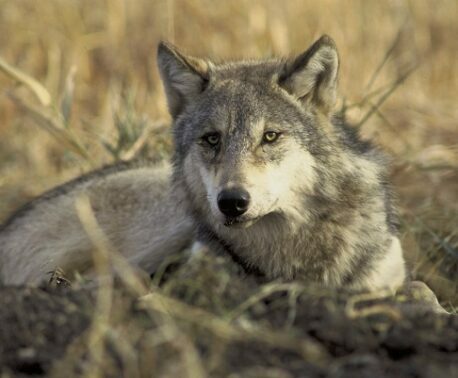 This winter no hunting has been observed in CWR, and no shots have been heard nearby. 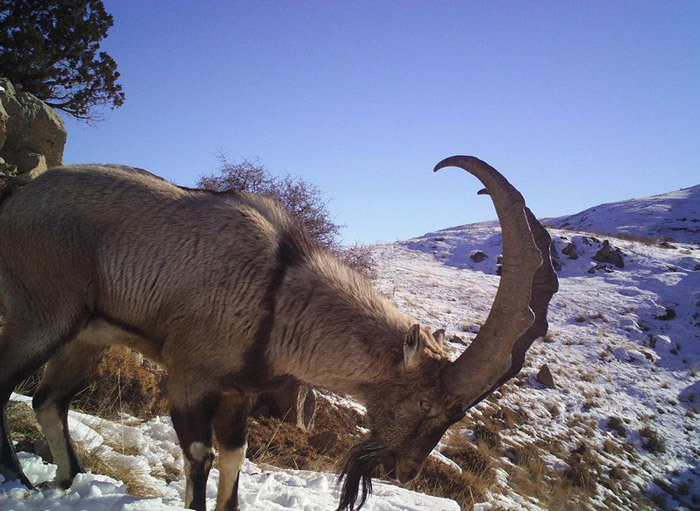 The camera traps in the reserve will be soon moved to higher altitudes of the mountains, as when the snow melts most of the mammals will move up the hills to graze and mate. You can support the work of Ranger Gor in the Caucasus Wildlife Refuge by donating to the Keepers of the Wild Programme.